This Workspace will be opened at startup if set. Ask for the Control and Slave code for the opened WorkSpace. Images are searched here. If not found a request is send to the Rocrail Server. 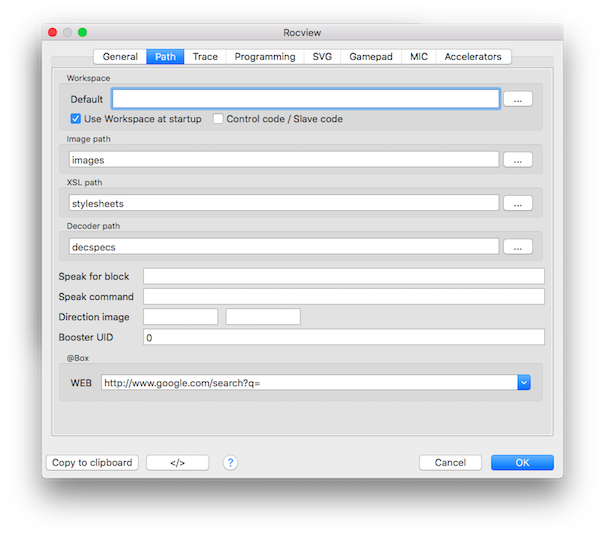 Note: Rocview uses the image found at its local path. To actualise an image from the server side it has to removed from this path first. Location to look for documentation stylesheets. Comma separated list of block ID's for executing the speak command for dynamic text updates. An "*" can be used as place holder for all blocks. The screen shots shows "2", so only text updates for block ID "2" will be spoken. Just extend the list like this: "2,5,6". And the client will speak for block "2", "5" and "6". The speak command for dynamic text updates. This command will be executed on the client (the machine where Rocview is running) when a text object is updated by a block listed in 'Speak for block'. The updated text is appended as parameter. For examples for scripts see Text->Speak to me. Optional direction images to be used in the loco tab throttle. The WEB search engine URL for the @Box. The URL for the Wiki Help links.